The latest, most accurate energy market news and insights. Cushman & Wakefield and Transparent Energy have released their Energy Market Update for September 2018. 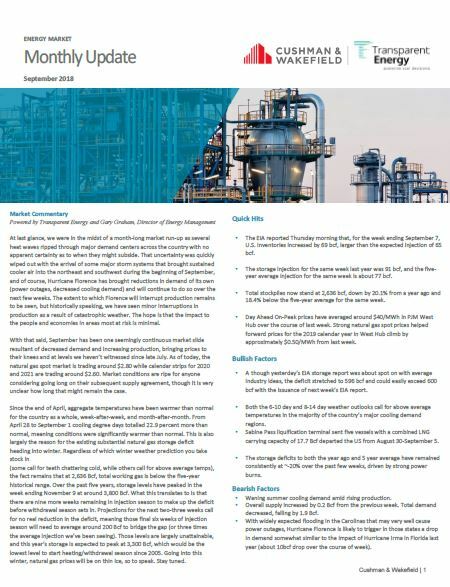 These monthly reports provide an overview of the economic, geopolitical, and meteorological factors affecting the energy market. September brings a market slide with decreased demand and increased production. At last glance, we were in the midst of a month-long market run-up as several heat waves ripped through major demand centers across the country with no apparent certainty as to when they might subside. That uncertainty was quickly wiped out with the arrival of some major storm systems that brought sustained cooler air into the northeast and southwest during the beginning of September, and of course, Hurricane Florence has brought reductions in demand of its own and will continue to do so over the next few weeks. With that said, September has been one seemingly continuous market slide resultant of decreased demand and increased production, bringing prices to their knees and at levels we haven’t witnessed since late July. As of today, the natural gas spot market is trading around $2.80 while calendar strips for 2020 and 2021 are trading around $2.60. Market conditions are ripe for anyone considering going long on their subsequent supply agreement, though it is very unclear how long that might remain the case. Other important happenings in the energy industry. Since the end of April, aggregate temperatures have been warmer than normal for the country as a whole. This is largely the reason for the existing substantial natural gas storage deficit heading into winter. Total stockpiles now stand at 2,636bcf, down 20.1% from a year ago and 18.4% below the five-year average for the same week. To learn more about these developments and to get the latest gas prices, electricity price trends, gas data highlights, and temperature probabilities read the full energy update.